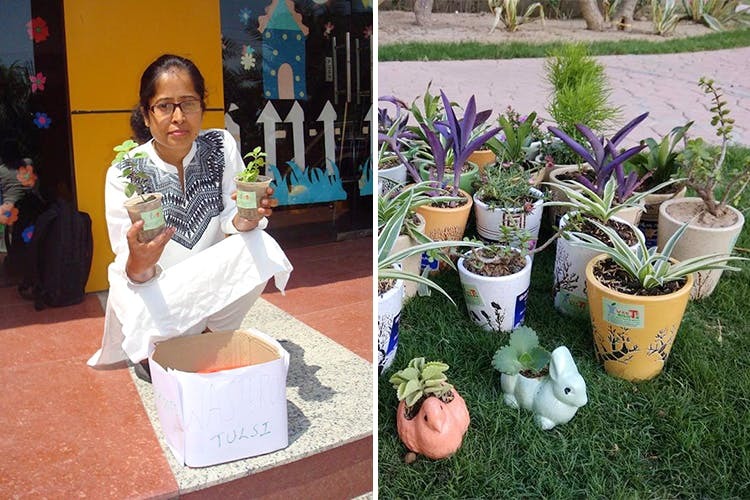 A Noida-based social enterprise—Wasteroots—lets Delhites exchange their old newspapers and notebooks for potted plants of the same value. The paper waste goes to a registered recycler and you come home with a new plant. What’s not to love, really? The story of how Wasteroots began is equal parts inspiring and heartwarming. Sudha Singh, the woman behind this exchange initiative, worked in a typical corporate set-up before she took a break from her job. During her time away from work, she realised that waste segregation in her locality in Noida (and in the city in general) was problematic. She also felt that there was barely any green cover in Delhi NCR. Since relying on the government to do something about this was not an option, Sudha decided to take matters into her own hands. She came up with the idea of providing people with the incentive of plants in exchange for their old newspapers. This solves two problems: Of waste segregation (all the paper goes to a recycler), and of the lack of greens. In the year 2016, she got Wasteroots, her one-person enterprise, registered. Today, Sudha has helped more than 4,000 people recycle, and gets calls from people across the country inquiring if the exchange facility is available pan-India. At the moment, the folks at Wasteroots offer the exchange facility in Noida and areas around only. You can set up an appointment with them (preferably for your locality) and the Wasteroots gardener and collectors will pick-up the paper waste from your doorstep. In return, you’ll get the plant of your preference. For every 11kg of paper, you get one plant of your choice (they have a list you can choose from). This, we feel, is a bit of a bummer. But the initiative nonetheless is commendable and there's a lot of good coming out of this. In case pick-up facility is not available in your area, you can always visit Wasteroots’ exchange store in Noida. The store is also a nursery, so if you love plants, you can come back home with more greens. Check out their website and Facebook for more info.